Details on the extra grants announced in the budget for businesses recruiting apprentices have been released. An extra £170 million is being made available for Apprenticeship Grants for Employers (AGE) in total, half for 2014-2015 and the remainder for the following year. From January 2015 the grants will also only be available to small businesses with fewer than 50 employees. Employers who have not had an apprentice in the previous year can apply for the £1,500 grant for up to the first 10 apprentices they take on. The provision for extra money is designed to ease the transition to the reformed apprenticeship landscape which government is pushing through with the help of industry ‘trailblazers’. Business Secretary Vince Cable said, “AGE has been very successful in encouraging smaller businesses to take on their first apprentices. 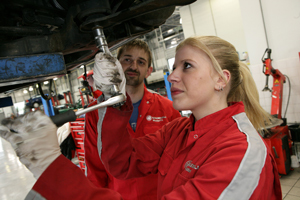 A further £20 million is being divided across the same two years to support the development of degree-level and postgraduate apprenticeships. The money is designed to part-fund the training of employees with businesses covering the remaining cost.